It has been raining the last few days. That may be an understatement. The wind is howling. The glass on the doors to my deck are shaking. 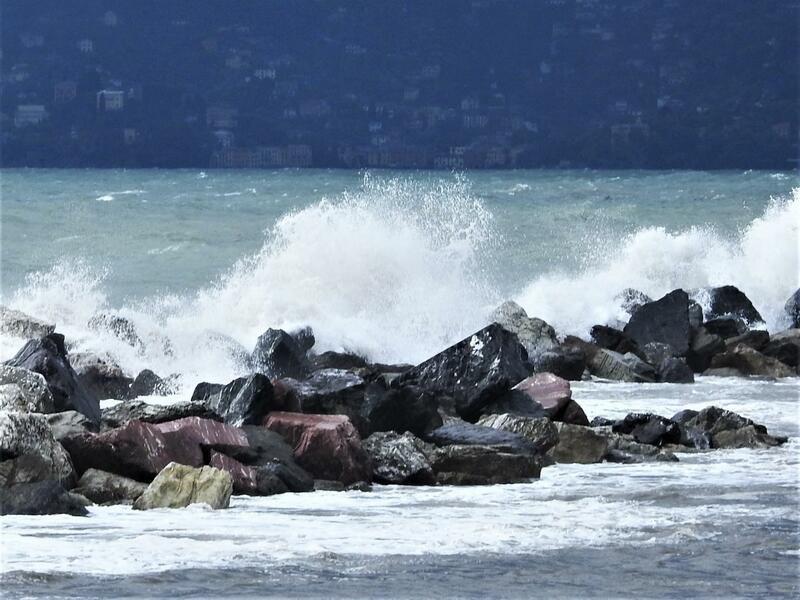 And I can hear the sea inside my appartamento. And I love it. 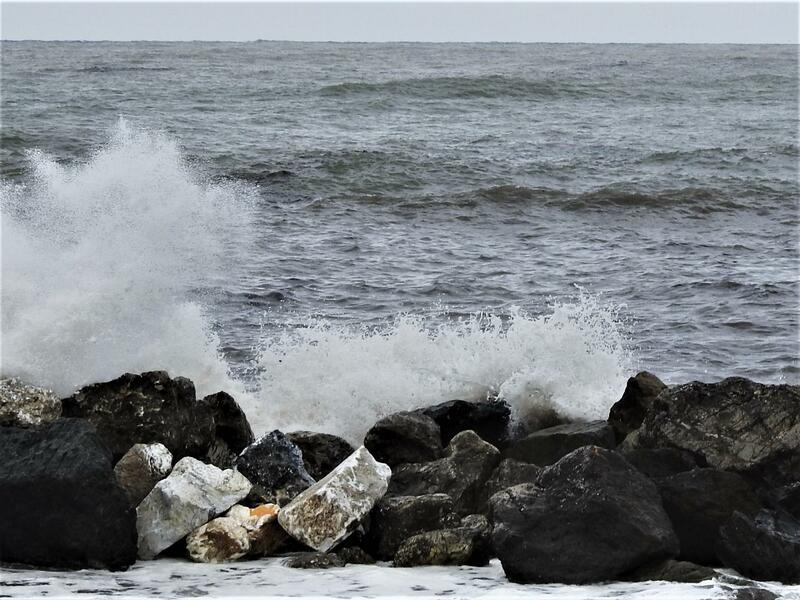 I am home in Chiavari. My journey took my onto a new Air Line, Norwegian Air. The prices were very good but I had read mixed reviews about Norwegian Air. 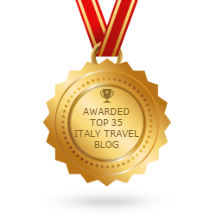 When I checked their flights from New York to Rome, I saw that they were being operated by another small air line with terrible reviews. That wasn’t going to work for me. Also, I would be carrying 2 big suitcases of small things from the States and all my clothing. I wanted to get a flight close to home to simplify carrying those bags. Norwegian Air had a flight into Pisa, via Oslo. That’s the one I chose. It was so inexpensive to fly in their Prime Class that I decided to check it out. Their Dreamliner airplane was huge, even in coach. My seat was large and quite comfortable. The meals were fine and the liquor flowed. The flight from JFK in New York to Oslo was 6 hours. After arriving in Norway, I had a few hours to wait between flights. The airport was not too huge to maneuver and there were plenty of places to buy food. Norway is not part of the EU and I had no idea what the exchange rate. Note to self: check that next time. My connection to Pisa was not in Prime Class. But it was again quite comfortable. You did have to pay for food and beverages, but it was a lovely flight. I would highly recommend Norwegian Air Lines as long as you check to see if they are actually manning the flight and not farming it out to another, small air line. That could be iffy. When I booked my flight, I did not check the trains. Before leaving for Italy, I realized that I would miss the last good trains home. With the help of my friends at Rome Cab Transfer, I found Francesco Ruo of Francesco Tour. One of his employees met me at the airport, carried my luggage to the car and drove me to my door in Chiavari. They were terrific. 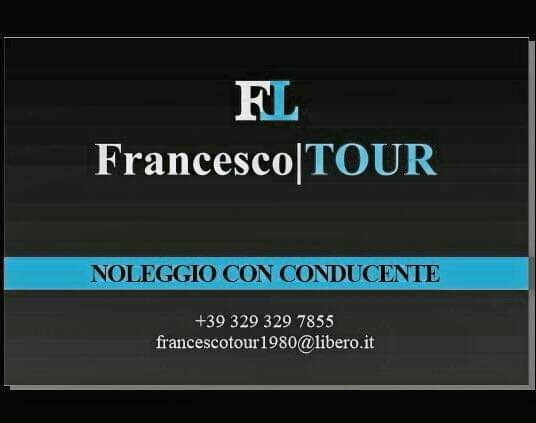 I would highly recommend Francesco Ruo of Francesco Tour if you are seeking a driver in Tuscany and Liguria. It is so very good to be home. I have more clothing to choose from every day. I can cook good food here. And I have been cooking quite a bit. 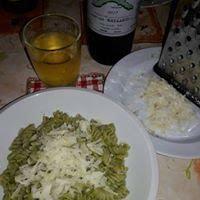 The first main meal I made was store bought Pesto. Even store bought was delicious. 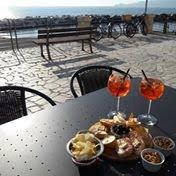 The next evening, I walked along the promenade, met a friend and enjoyed my first Aperol Spritz aperitivo in nearly six months. The sun was about to set, and it was warm outside. This is home for me. The weather was changing, however. Over the last two days, we have been under a Red Flag Warning. 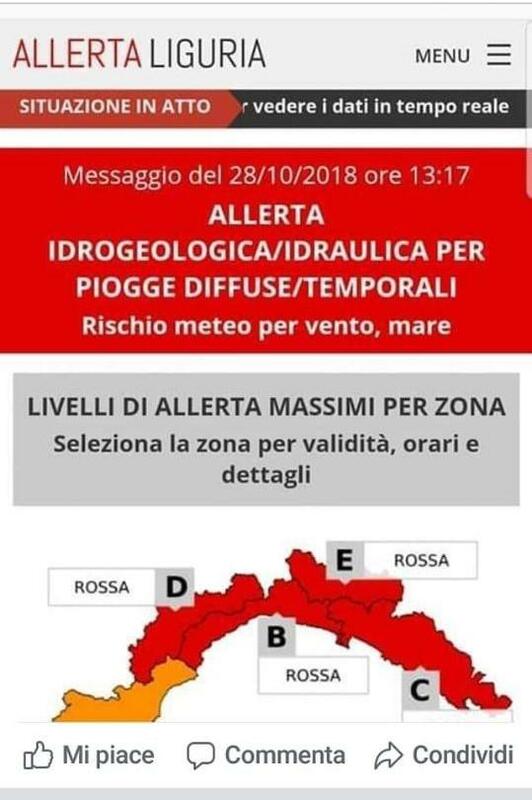 This is an Italian weather service warning. Red is the worst. 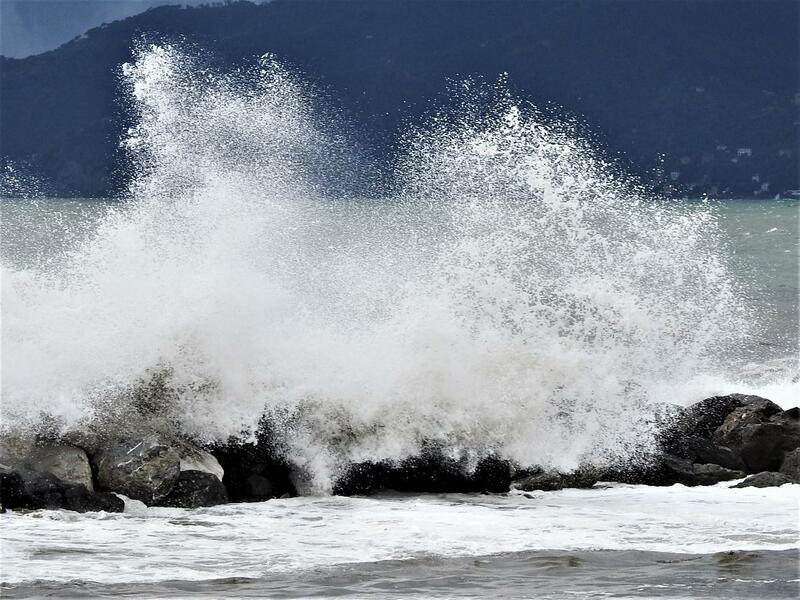 We have had high winds, flooding, and the waves are vicious. That spray is at least 15 feet in the air. Do you see the shape of a dog’s head on the left? I do. These photos were shot before the super high winds. 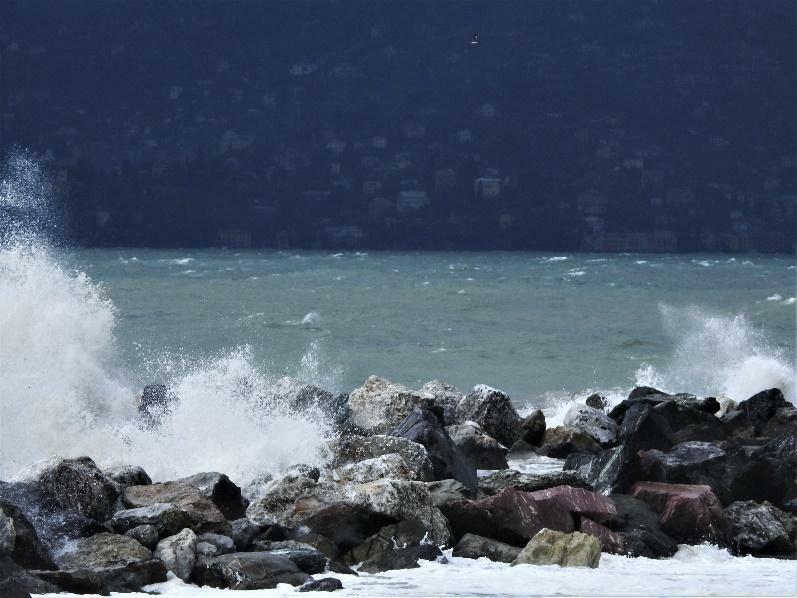 Yesterday, the sea wall in Rapallo collapsed from the raging wind and water. 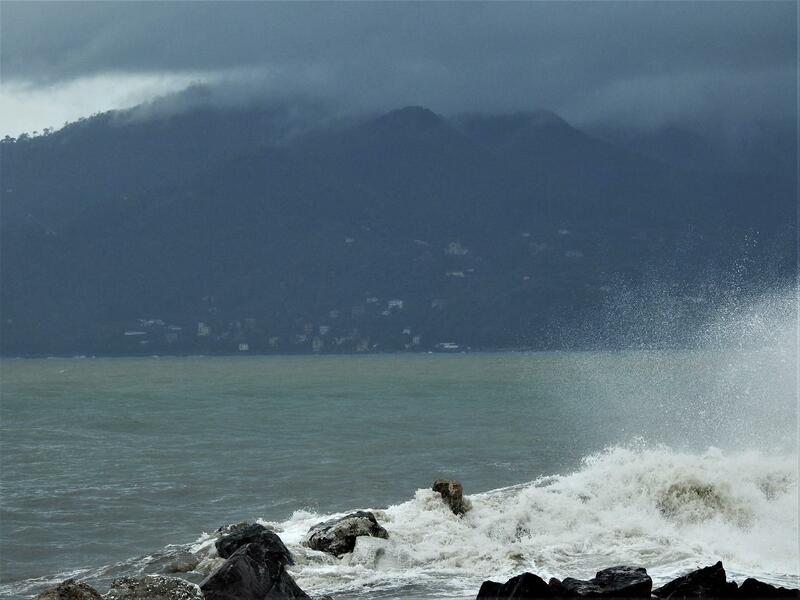 Chiavari had a warning to evacuate immediately all low areas near the Entella River. But it improved. However, downtown Chiavari flooded, the underpasses below the train tracks were closed and I witnessed a sewer cap forced upward and dirty water pouring out of it. I returned home and I cooked some more. I made Risotto. 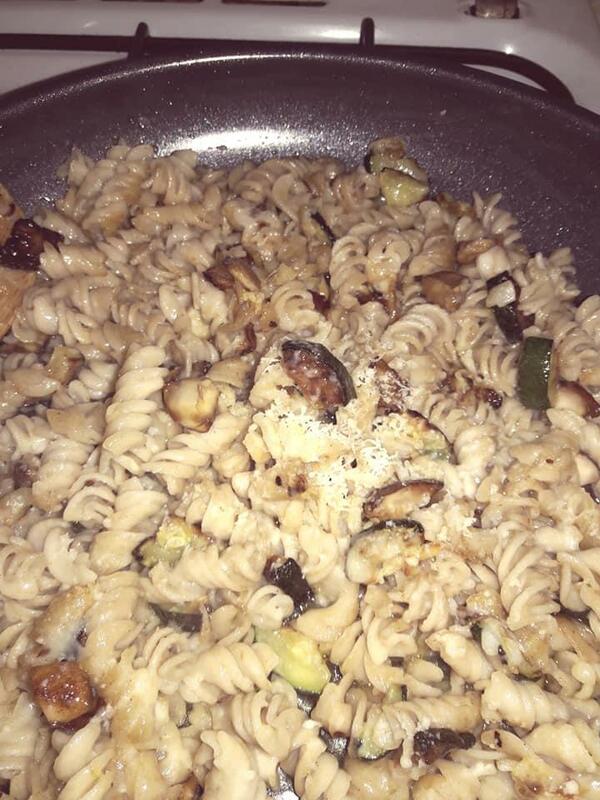 I cooked Pasta with a pecorino, olive oil coating and fresh mushroom and zucchini in it. It was so tasty. Every bit of food I cook here tastes ten times better than what I made in the USA. I have missed cooking here. I have missed the flavors of fresh and local vegetables, excellent extra virgin olive oil. And, wow, I missed pesto. Today the weather is fierce once again. I don’t mind it. 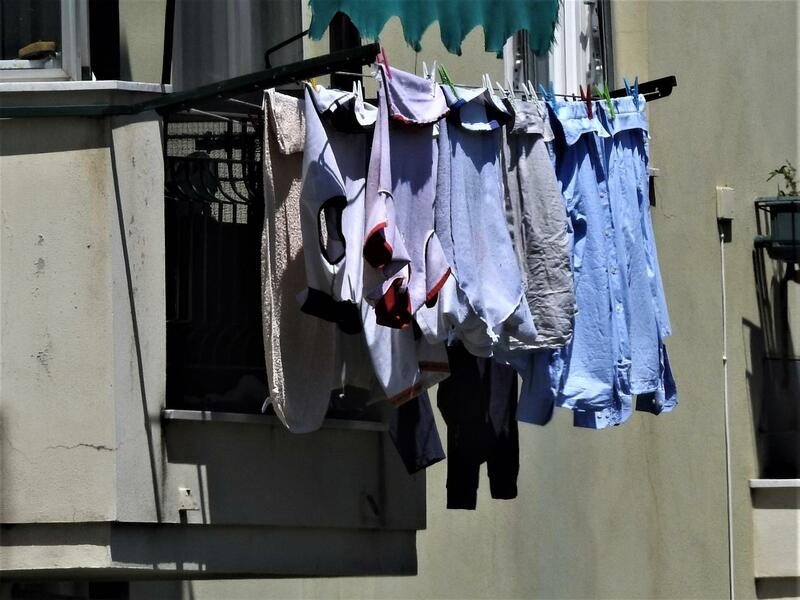 I am slipping back into my vision of the life in Italy. I am not rushing to do things. I know it is ok to stay home and cook or rest. I am back into la dolce far niente, the sweetness of doing nothing. It took a long, difficult path to get here. But I am home. I see a head with an afro hairdo on the left side of this one, with the rock as her nose. Do you? Enjoy your free time. Stare at clouds and look for shapes there if you do not have the waves to wow you. Enjoy the little things. And dream of visiting Italy. When you are ready to visit, I can help you.